Photograph of the interior of Cave 26 at Ajanta from the Allardyce Collection: Album of views and portraits in Berar and Hyderabad, taken by Robert Gill in the 1860s. The remarkable cave temples of Ajanta are situated in a horse-shoe valley of the Waghora River in West India and consist of prayer halls (chaityas), or monasteries (viharas), built for the Buddhist community who lived there. The caves were in use for about eight centuries, and can be divided into two groups according to the early Hinayana and later Mahayana phases of Buddhist art. The first group was excavated between the 2nd-1st centuries BC. After a period of more than six centuries, the excavations restarted around the 5th century AD, in the Vakataka period. 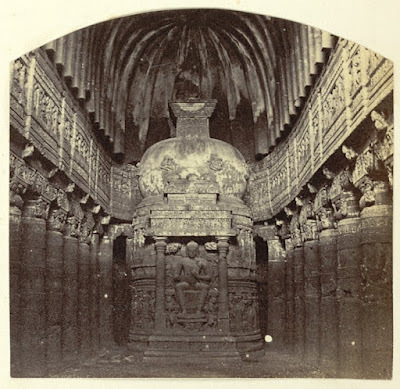 Cave 26 is a large and elaborately decorated chaitya hall that belongs to the 5th century AD. A columned verandah, now almost destroyed, preceded the courtyard before the cave. The facade is dominated by a large shoe-shaped window above a columned entrance, decorated with rows of carved figures of Buddhas. The interior of the cave comprises two rows of fluted columns decorated with bands of floral patterns. At the end of the central nave there is a stupa with a sculpture of a seated Buddha figure.